June 2, 1998 one of my childhood favorites died. 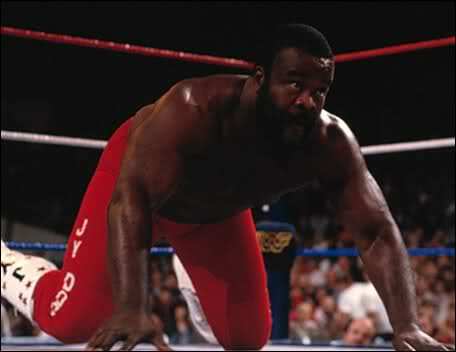 Sylvester Ritter, aka, the Junkyard Dog fell asleep behind the wheel and crashed his car. He was 45 years old. 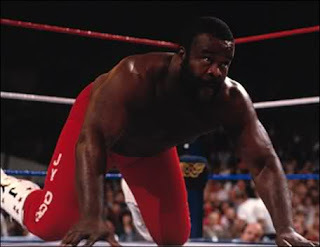 JYD was one of the first wrestling personalities I remember watching. He wrestled briefly in World Class Championship Wrestling and I vividly recall his "headbutt" challenge with the Missing Link. Up until that point, no one could handle one of Link's headbutt, but the Dog stood toe to toe with him. It wasn't long after that, JYD showed up in the WWF. Naturally he caught on with the fans quickly. After each victory on Superstars, the Dog invited young fans into the ring to dance. At that point, he was coming to the ring to Queen's "Another One Bites the Dust." It wasn't long though that the rock n' wrestling connection opened the opportunity for the WWF to produce "The Wrestling Album" and Dog sang his own entrance "Grab the Cakes." Admittedly JYD was no great vocalist, but the song was a catchy tune that I still sing out loud to when it comes up on my iPod. I felt like JYD's stint in the WWF should have included a run with the Intercontinental title. He wrestled Greg "the Hammer" Valentine for the championship at Wrestlemania and won the match via count out. As a 12 year old at the time, I felt like Dog was screwed. For me, it was the biggest disappointment of the night. Junkyard Dog did win the Wrestling Classic tournament, beating Randy Savage by count out in the finals. He had a lot of mid card feuds after that, never quite reaching that brass ring, or gold belt, but he definitely was over with the fans and finally got his due and was included into the WWE Hall of Fame six years after his death. 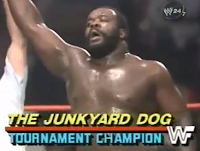 I have to believe if he were still here today, Junkyard Dog would be making guest appearances on Raw and SmackDown with the likes of Hacksaw Jim Duggan, Ted DiBiase, and Dusty Rhodes. Rest in Peace JYD.